Bet Raiders +3.5 over 49ers with Karamba. Bet Raiders-49ers under 47.5 with 888Sport. Bet Raiders to win 1st half and 1st-half over 23.5 at +325 with 888Sport. Another week, another bad beatdown for the Oakland Raiders. This time, the Raiders were handled, 42-28, at home by the not-so great Indianapolis Colts. It was the second straight time the Raiders surrendered 42 points at home. They did it four weeks ago to Cleveland. Oakland is 1-6 and clearly are one the worst teams in the NFL. Thursday night’s game at San Francisco, which is 1-7, should have major ramifications in the chase for the No. 1 overall pick. Oakland’s defense is a major reason why it is in that draft-pick race. Through seven games, Oakland has just seven sacks. It is simply not even getting close to the quarterback. The Colts’ Andrew Luck was hit once Sunday. The Raiders have 56 quarterback pressures. It’s the fewest in the NFL. According to Pro Football Focus, the next fewest is Detroit with 100. So, the next worst pressure defense in the NFL almost has twice as many as the Raiders do. Oakland is doing very little right on defense. Coach Jon Gruden is desperate. 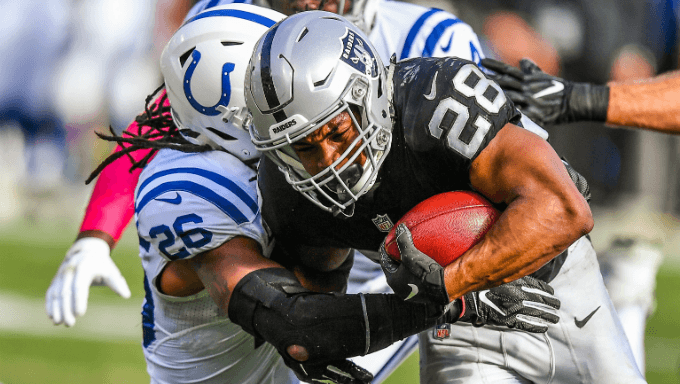 Last week, he started players several young players and made veterans such as Reggie Nelson, Rashaan Melvin and Emanuel Lamur healthy scratches against the Colts. All three were signed by Gruden this offseason. Oakland’s offense did have a bounce-back game, after scoring a total of 13 points in the two games prior to the bye. Oakland had four long scoring drives and looked good until a typical fourth-quarter collapse when the Colts outscored the hosts, 21-0. Oakland quarterback Derek Carr has been under lot of pressure amid trade rumors. He had one of his best games against the Colts before wilting in the fourth quarter. He didn’t seem to miss top receiver Amari Cooper, who was traded to Dallas last week. Still, Cooper’s replacement was journeyman Brandon LaFell. He is only going to help them so much. Doug Martin, the injury replacement for Marshawn Lynch, who is on the injured reserve with a groin injury, had a solid game with 72 yards on 13 carries. He was better than he should earlier in the season. But Martin did have a key fumble in the fourth quarter. Still, he will remain the Raiders’ primary tailback. The NFL did the Raiders a solid. Yes, their Thursday night game is on the road, but it’s 25 miles down the freeway. So, Oakland’s short week will not require anything more than a short bus ride as they prepare to play in the Nick Bosa Bowl. It’s the Bad News Bay Area NFL season. The 49ers are having nightmare season. Quarterback Jimmy Garoppolo, who was lost for the season in September with a torn ACL. The 49ers have been riddled with injuries. Going into this season, the 49ers were considered a playoff sleeper. But the season has unraveled, and it is clear the 49ers still need some roster reloading in addition to better health. Oakland hopes left guard Kelechi Osemele can return for knee injury that has kept him out the past three games. The line has badly missed him. The team is also hopeful second-year defensive tackle Eddie Vanderdoes can make his season debut. He tore his ACL last December. San Francisco coach Kyle Shanahan said quarterback CJ Beathard would be ready to play Sunday with a wrist injury, but Thursday is up in the air. Beathard told reporters Tuesday he thinks he can play Thursday even though he is having problems gripping the ball. If Beathard can’t play, Nick Mullins will make his debut for the 49ers. Karamba has the 49ers as a 3.5-point favorite. , but I like the Raiders in this one. And I like them pretty comfortably. Yes, I realize they are a one-win team. But I think they have a better offense than the 49ers, especially with their quarterback issues, and both teams have poor defenses. There will be a lot of Oakland fans in the stands, so this will hardly be a road game. This smells like an Oakland win. Take Oakland +3.5 with Karamba. With an over/under set at 47.5 with 888Sport, I’m leaning under. The bottom line is both of these teams are porous and both will make plenty of mistakes. So, getting to 48 points may be slightly too much to ask for. Bet the under with 888Sport. I like the Raiders to win the first half and going over 23.5 in the first half. I think the Raiders will have some early success. They aren’t bad first-half team. They led at halftime in four of their seven games despite being 1-6. So, I can see a 17-10 Oakland lead at the half. Bet the parlay at +325 with 888Sport.